FQB "Cottage Garden" Collection literally leads you down the Garden Path!! Flowers, a weathered picket fence, gardening tools and boots....take it all in people!!! Enrich your digital scrapbooking layouts, cards, and mini albums with these richly "grown" digital papers and elements that will give you stunning results. 1 Weathered white birdhouse with flowers painted on....what bird would not love this?! 1 Birdhouse with flowers growing up the side as if they're on a trellis....the Honeymoon "Tweet"
7 Buttons with metal-like edges and coloured centres...very chic! 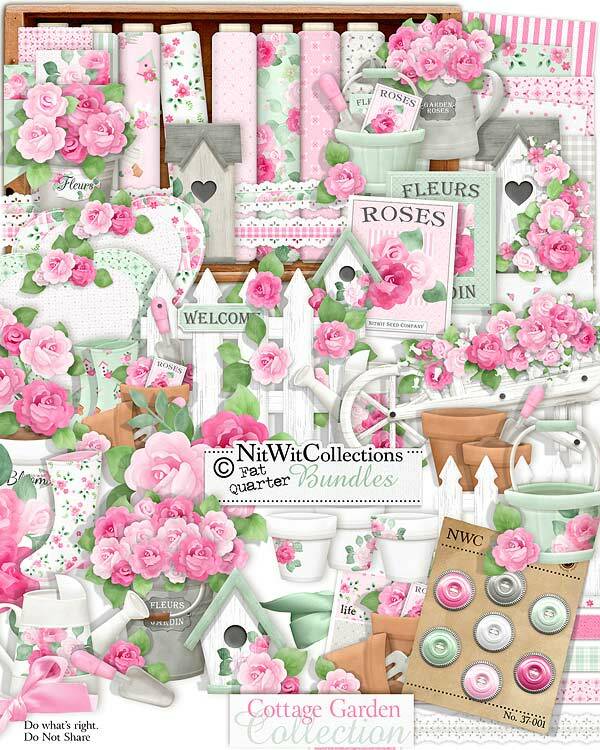 1 Cluster scene that includes so many of the fantastic elements this kit has to offer....the picket fence, flowers, birdhouse and of course your boots and gardening tools. This easy to use element will be the showpiece to any of your creations. 4 Gardening boots in four differently patterned and coloured looks...which one will you put on?! 2 Heart mats with simple and open centres for your photos, journalling, pull out tags or main elements. See how we chose to use these in our card making idea above. 3 Lace borders with different ribbon strips in their centres....are you thinking cottage chic for your creation? 1 Rose cluster that contains several rose blossoms complete with leaves...let "Mary Fran Nature" do the work of "growing" these...you can just use them! 2 Seed packets of roses....one in pink and one in the green hue. Both such perfect elements to tuck into your creations!